Clearly, we need to talk packaging before anything else. 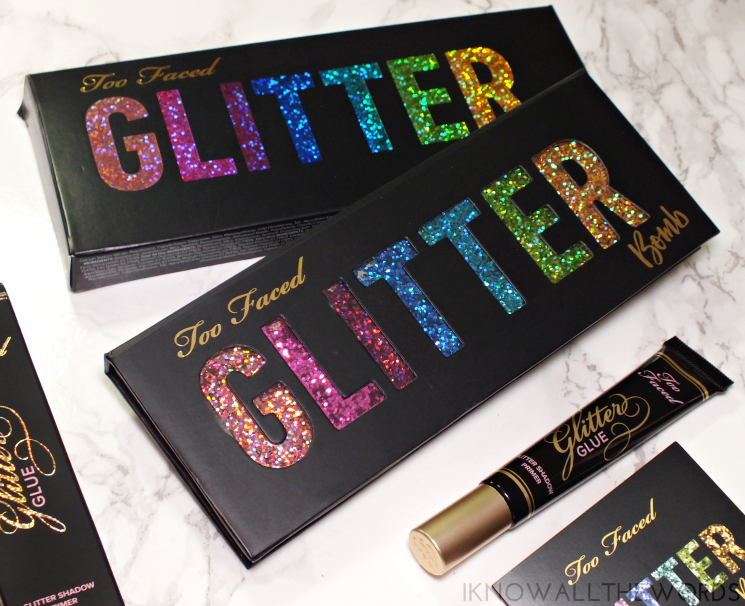 Too Faced went with the most obvious design, as the Too Faced Glitter Bomb Prismatic Glitter Eyeshadow Palette features the word of the day (aka glitter) in large glitter filled letters. Oh yeah, the glitter isn't just on the letters, they're filled (kind of like a snow globe, but sans liquid.) The deign does require a thicker cover on the palette, but it doesn't make it seem too much bulkier. The rest of the palette is simple black with gold detailing for the shade names, and around the full size mirror, as well as around the pans. 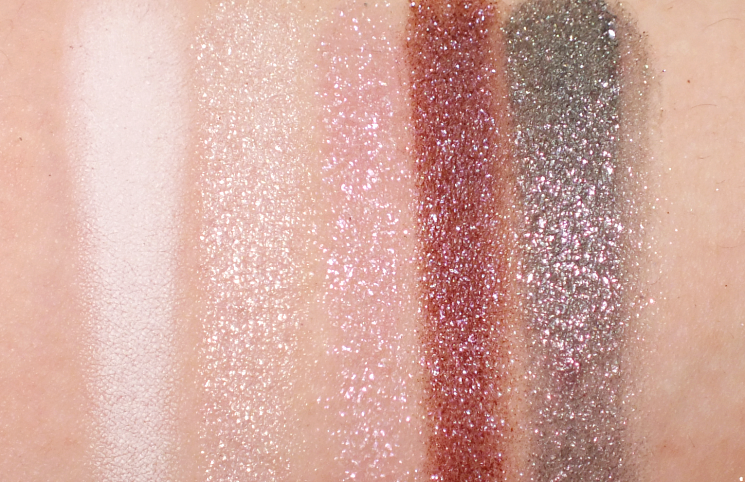 The eight glitters are very much glitter shadows, but there are two differing formulas represented here. A few shades (Fairy Dust, Confetti, and Rosé all Day) have little to no base shade, and as such are best as toppers and even then a glitter primer is going to work best. Actually, a glitter primer is best with all of these shadows, as the glitter can easily fall away if you're not just placing these on. Fairy Dust: white with champagne-pink glitter. This shade doesn't have much base colour, and works best on the white base or as a topper. Confetti: lavender-pink with pink glitter and the same formula as Fairy Dust. Hot Damn! : plummy-orchid shade with violet glitter. I find this looks more purple or plum depending on the lighting. Glitter Goals: blue-grey with pink-violet glitter. Super pretty! Rosé all Day: soft rose with pink glitter. Another shade best layered, but very sparkly and gives a gorgeous shimmer. Oh, it's On! : warm gold with light green glitter. 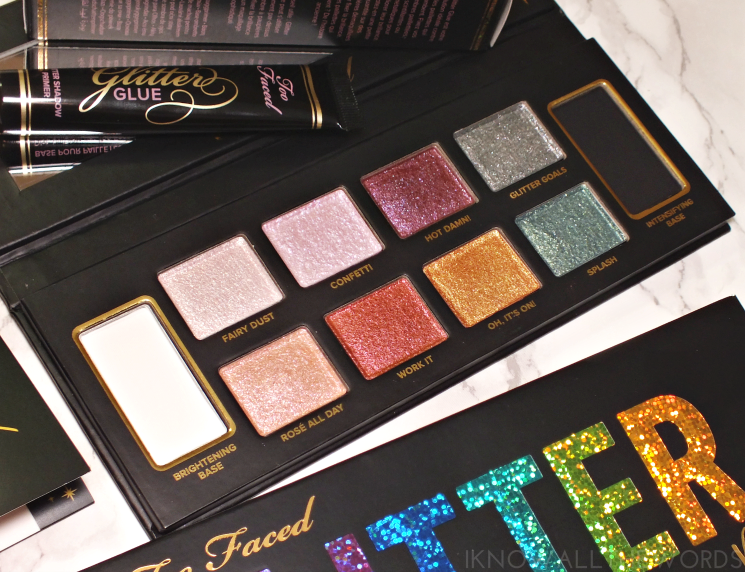 I mentioned that a glitter glue is helpful with this palette, so it only makes sense to look to the Too Faced Glitter Glue Shadow Primer. 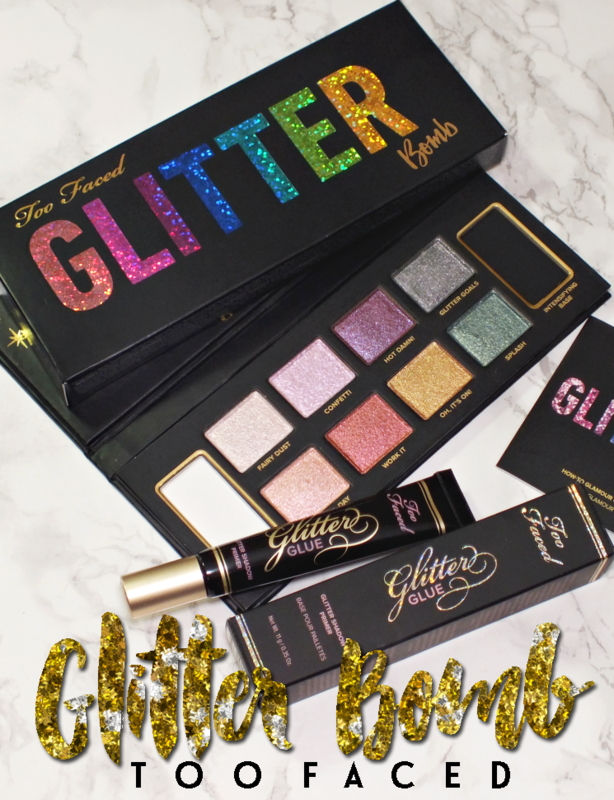 The primer is the slightest bit tacky, making it perfect for locking glitter, shimmer, and metallic shadows down for the entirety of their wear and intensifying their finish. The smallest amount works to keep fallout to a minimum (it's seriously great!) but also keeps them exactly where you placed them until you remove them. 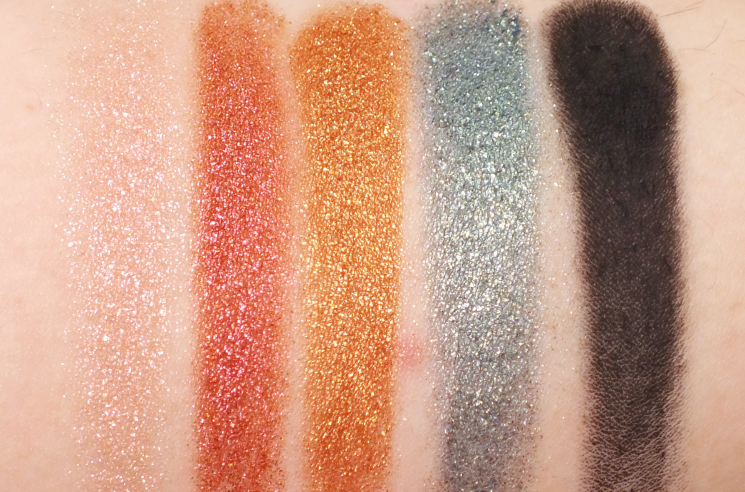 This can be used on bare lids, or on top of shadow for spot placement of glitter. 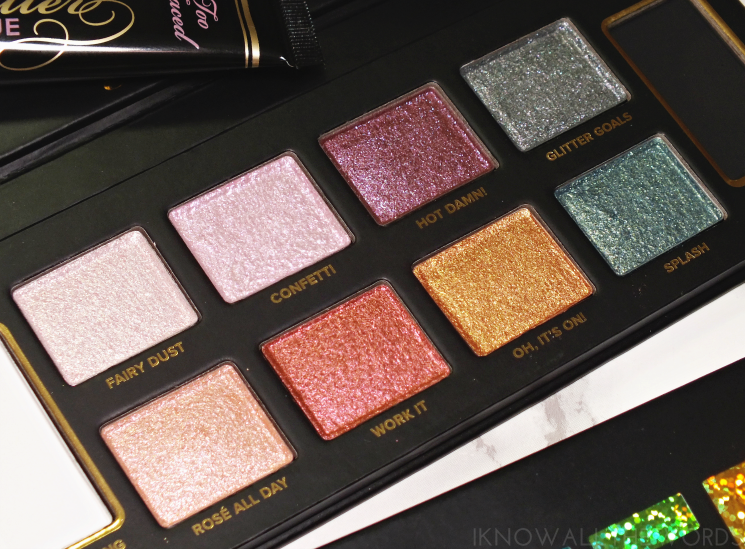 As with most Too Faced palettes, the Glitter Bomb comes with a look book featuring four looks. They are all about the glitter, but I couldn't help but recreate the most glittery of the bunch. The Disco Fever look uses the Brightening Base with Splash on the inner third of the lid, Glitter Goals through the middle, and Hot Damn! on the outer third and bottom lash line. 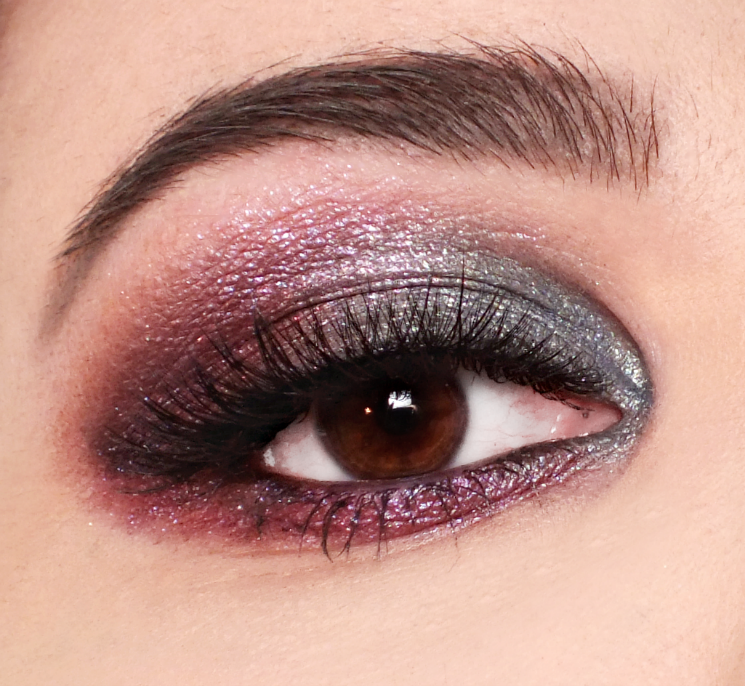 I used a bit of Kat Von D Anthem through the crease and lash line as a base to ensure the purple tones of Hot Damn! came through. I used a bit of the intensifying base as liner and finished the look off with mascara and House of Lashes Pixie Luxe lashes. Overall, I am really loving this palette! I like that the shades are colourful, but still really wearable, and as such can easily be incorporated into a lot of eye looks. Of course, this won't suit you if you wanted super bright shades (like what is shown on the palette packaging.) 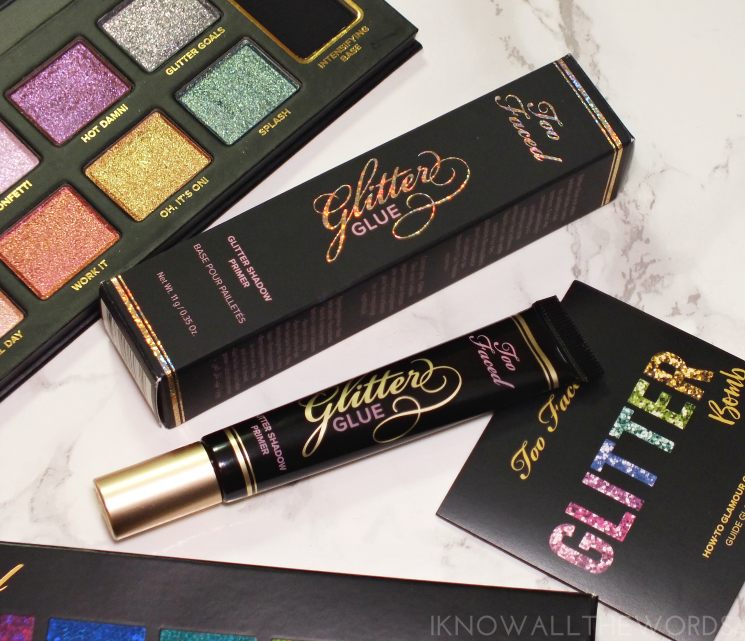 The glitter glue should come as a sample with this though, as it really does enhance use. Basically, if you pick this up, get the glue too. What do you think? Do you need this much glitter in your life?